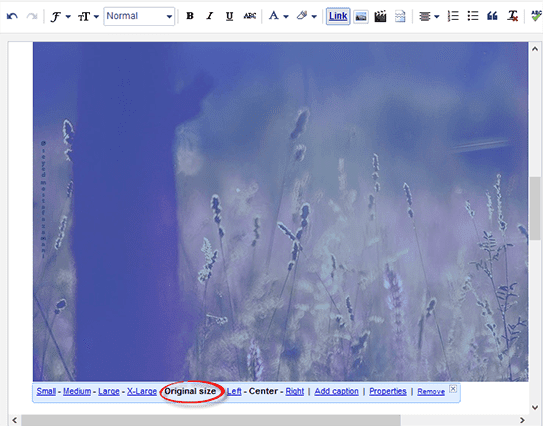 Blogger offers most of the tools you would need to add and resize Blogger images quick and easy. You can upload photos directly on the platform and even change the dimensions based on the type of content that you are attempting to produce. Once you select the image that you want to use, you'll see four image sizes to choose from - small, medium, large, and x-large; it also gives you the option to determine the alignment. If you find that the four preset dimensions aren't providing the outcome you desire, there are easy ways to resize Blogger images to custom dimensions in order to fit your blog post area. If you know that you are going to need to resize Blogger images once you post them to your blog, make sure that you start with a photo larger than the 640px dimensions of the x-large option. It's easy to bring an image down in size, but if you try to make a small image bigger, you'll lose some of the quality. Just make sure that you watch out for the file size containing the image; the larger the file, the slower it will load on your website. Photoshop is a powerful image editor that can help you to resize Blogger images or modify your images before you post, but it is also an expensive investment. There are also many other freeware image editors that can perform the simple task of resizing the photo. Determine what size you'd like the photo to display on the page and manually resize Blogger images to those dimensions; other users have found that 700px is a pretty flexible width size that works well on posts. 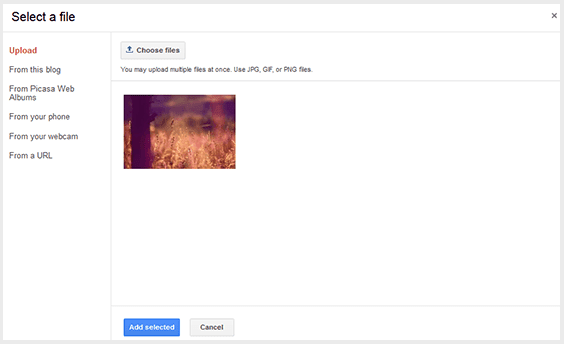 Once you've got your photo resized and added to your post, click on it and choose the 'Original size' option. If your photos are going to exceed the post editor, it probably means that they are larger than the body of your post, so let's fix that and make them fit exactly. 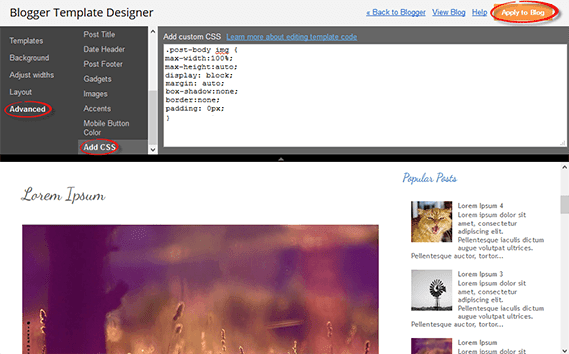 Next, you'll want to modify the CSS of your Blogger template to accommodate the adjustments. Don't worry; you won't need much coding experience to complete this task. Adding the code to this section, automatically adds it between the <b:skin>....<b:skin> tags of your Template (Template > Edit HTML, above the ]]></b:skin> tag). 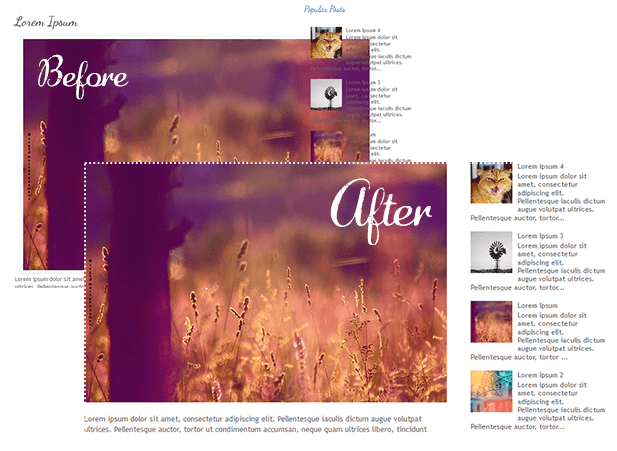 So, no matter whether you add it above ]]></b:skin> or within the Add CSS box, the effect should be the same. Remember that when you make changes to the CSS of the blog's Template, these changes will affect every post previously added, using the "Original size" dimension option. This code will get rid of any borders and padding around the image and give it a much more natural look within the post. Hit the "Apply to Blog" button once you've finished adding it. Please consider that, if you have posts with photos floating either on the right or left side of the content, they will automatically go full width. After making the adjustments to both file size and CSS, you may go back to the post editor and repeat the Step 1 to add an image. When you return to the screen that asks for size, click on the "Original size" option and confirm your choice. Your newly added image will then be displayed with the adjustments that you created, so that it fits nicely the width of the post area. Very very helpful, thanks! Often while finding templates, this feature was *SO* missing. Hi Monika, and thank you for the comment! I'm glad it was useful to you. That was Great :) I added most of your styles to my blog and it looks neat. Hey, What should I do if the first code doesn't work on my blog? Images are just same size. Thanks for this tip! This worked great on my blog, and the pictures looked fine when viewed on a computer but when viewing my blog on a tablet / mobile phone, the pictures were distorted. Dunno why though so now trying to find an alternative to this code. This code worked great for all my images in posts! I was wondering if there is a way to apply this to all the images used in your "auto read more with thumbnail" tutorial. That way the images on the home page also were automatically resized. Thank you so much - so useful. Blogging is made so much easier because of sites like this!! can U explain How to "Resize to Smaller with Automatic Alignment " of images code for blogger. Pls help me with this. searching for long time. Change 150px and 170px with the width and height of your pictures. Hope it works. Sorry for the late reply! It took me 5 minutes to make a big difference in my blog. Thank you! Exactly the information I was looking for! Such a great tip! thank you so much. Awesome! This is just what I was looking for! But, when I used this code, large spaces were put between my images. Is there a way to get rid of those? This has worked perfectly on my blog. Thank you! Thank you so much. You have helped me , yet again!!! Thanks soooo much!!! Somehow my previous code stopped working and this SAVED ME!!! Great website with amazingly simple and effective tips for bloggers! Much appreciated. OMG THANK YOU SO MUCH!!!! !